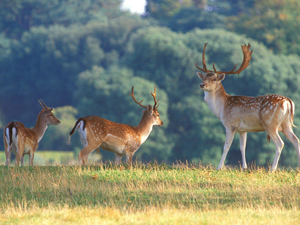 Deer Park at Holkham Hall01328 710 227work Wildlife ParkThere is always something to see and do in the park. Why not explore one of our three marked walks and along the way see some spectacular landmarks such as the monument to Coke of Norfolk and the obselisk as well as other fascinating buildings like the Great Barn and the impressive thatched ice house. Follow our nature trail with its fun family quiz and discover the wealth of nature which calls Holkham its home. To explore further afield why not hire a bicycle from the cycle hire centre or for those who prefer something a little different, explore Holkham's watery world by canoe, kayak or rowing boat. There is always something to see and do in the park. Why not explore one of our three marked walks and along the way see some spectacular landmarks such as the monument to Coke of Norfolk and the obselisk as well as other fascinating buildings like the Great Barn and the impressive thatched ice house. Follow our nature trail with its fun family quiz and discover the wealth of nature which calls Holkham its home. To explore further afield why not hire a bicycle from the cycle hire centre or for those who prefer something a little different, explore Holkham's watery world by canoe, kayak or rowing boat. Well behaved dogs on leads are welcome in the park. Car parking charge £3.00 per day.